The Mo- Sheringham Museum01263 824482work MuseumThe museum tells the fascinating story of Sheringham's history through its people and boats. We are proud to hold three lifebotas which served the town over 150 years, as well fishing boats and crab boats made by local boat buliders. Our displays about the history of Sheringham include wonderful objects, such as the zeppelin bomb which hit the town in World War One (the first zeppelin to fall on the UK) and work by famous local artists, including Tom Armes and Olive Edis. We have a year-round events programme, which is suitable for the whole family. Our popular 'Holiday Make' drop-in arts and crafts workshops take place every Wednesday of the school holidays (£3 per child; free for one accompanying adult per child). We also hold family-friendly talks in the evenings, as well as other exciting events, like pirate treasure trails and fossil making. We are poud supporters of the Kids in Museums manifesto, and love welcoming families to the museum. 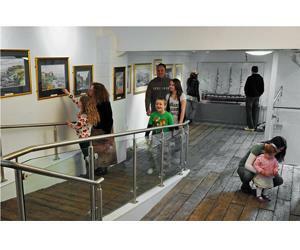 The museum tells the fascinating story of Sheringham's history through its people and boats. We are proud to hold three lifebotas which served the town over 150 years, as well fishing boats and crab boats made by local boat buliders. Our displays about the history of Sheringham include wonderful objects, such as the zeppelin bomb which hit the town in World War One (the first zeppelin to fall on the UK) and work by famous local artists, including Tom Armes and Olive Edis. For more information about our events programme, please visit our website: www.sheringhammuseum.co.uk, where you can also sign up for our e-newlsetter. You can also find us on Twitter, Facebook, Flickr and WordPress. Amenities room and viewing tower will give all round view including Wind Farm. Visitors normally spend approximately one hour in the museum. Therefore, although we do not have a latest admission time, visitors may wish to enter the museum no later than one hour before closing time. From roundabout on main coast road proceed into the town. Car park on left. British Rail station on right. Pass town clock and carry on to sea walk. Turn right at Two Lifeboats Pub and the Museum (MO) is directly in front of you with another car park on right.